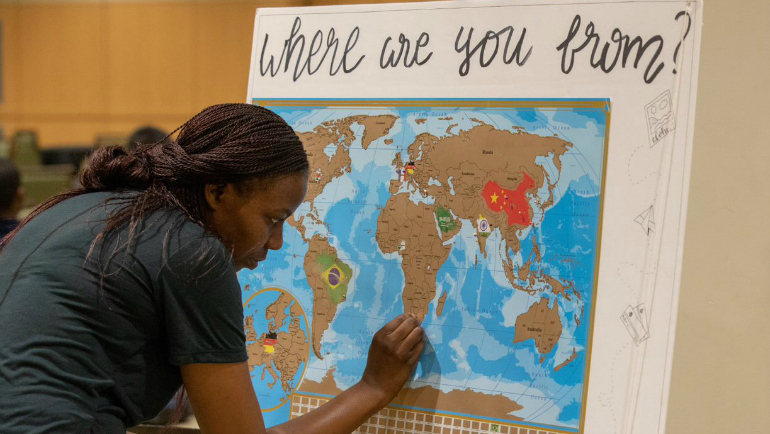 Wayne State University is one of 57 colleges and universities nationwide to join the #YouAreWelcomeHere national scholarship program, pledging to create scholarships for international students to study in the United States. Temple University leads the national initiative, which began in May 2018 with nine universities, on the heels of a widespread social media campaign. To date, the #YouAreWelcomeHere program has received commitments from institutions from Maine to Hawaii and from community colleges to large, public universities. “Building on our proud history of serving international students — this year’s class hails from 77 countries — we at Wayne State University are proud to support the #YouAreWelcomeHere campaign and help launch its scholarship program,” says Ahmad Ezzeddine, Wayne State’s associate vice president for educational outreach and international programs. Beginning in fall 2019, each of the 57 participating colleges and universities will offer two annual renewable scholarships, which will cover a minimum of 50 percent of recipients’ tuition. These scholarships support incoming international students who are committed to furthering the #YouAreWelcomeHere message through intercultural exchanges that bridge divides at their future campuses and beyond. “Through our investment in supporting the #YouAreWelcomeHere scholarship, we not only help attract great talent to the university, but also continue to enrich our WSU community and advance our global and internationalization agenda,” Ezzeddine says. To qualify, international applicants must hold citizenship in a country outside the U.S. and cannot possess U.S. citizenship or permanent residency. Interested students must apply for admission to one of the 57 participating universities or colleges before completing a #YouAreWelcomeHere scholarship application and submitting it directly to the university or college of choice. Wayne State’s application is online at go.wayne.edu/yawh.